The 2017 Planes of Fame Air Show celebrated the Planes of Fame Air Museum’s 60th anniversary and the 25th year they’ve held the air show at Chino Municipal Airport in Chino California. 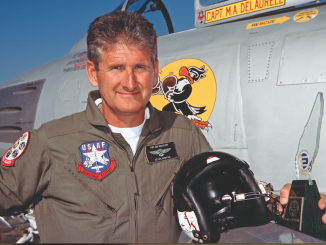 The 2017 air show also marks the first time that Planes of Fame’s Founder, the legendary Ed Maloney, was not at the announcer’s stand. Sadly, Ed passed away last year, just a short time after the 2016 event, so the museum presented this year’s show in his honor. Despite the unseasonably cool and cloudy weather, with highs in the low 60s, an estimated 35,000 people attended the air show. 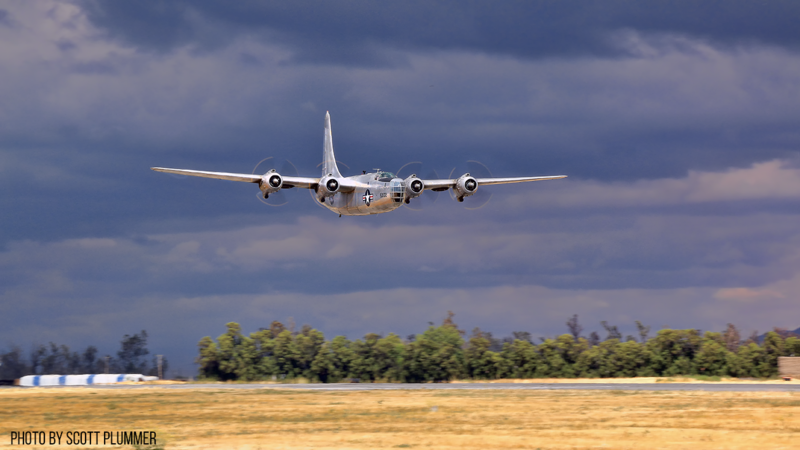 The event is one of the museum’s two key annual fundraisers, with the money helping to pay for aircraft maintenance, restoration and general operating expenses. The air show opened its gates at 8:00am each day and flying started promptly at 10:40am. A panel discussion took place each day at 9:30am which featured combat veterans talking about their personal experiences in World War II, Korea and Vietnam. 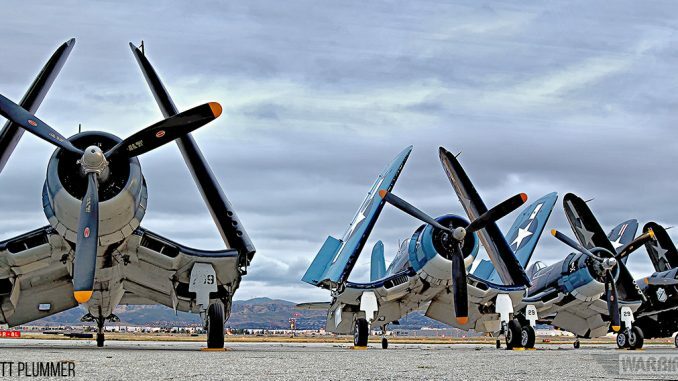 On Saturday, World War II US Marine Corps pilot, Major John Tashijan, and the son and daughter of his squadron mate, Lt. Col. Ferrill A. Purdy, were united with Planes of Fame’s F4U-1 Corsair Bu.17799. Both Tashijan and Purdy flew this very aircraft in the South Pacific (click HERE for the story). As word spread through the crowd, John Tashijan and Purdy’s son Greg Purdy and daughter Gayla Maier were surrounded by air show guests wanting to ask questions and take photos of them with the Corsair. Many thanked Major Tashijan for his service during World War II in an understandable outpouring of respect. A formation of some of the museum’s rarest aircraft opened the flying each day. The Northrop N9MB Flying Wing, Boeing P-26 Peashooter and Seversky AT-12 lead the formation, with a second flight featuring the Mitsubishi A6M Zero, Lockheed P-38 Lightning, Vought Sikorsky F4U Corsair and North American P-51A Mustang. This was in tribute to Ed Maloney and served as testament to the amazing collection of aircraft he was able to save during his lifetime. The Planes of Fame Air Show is known the world over for flying one-of-a-kind vintage warbirds, either from its own inventory of unique aircraft or those from other flying museums or private owners that the museum has built relationships with over the decades. This year was no different. 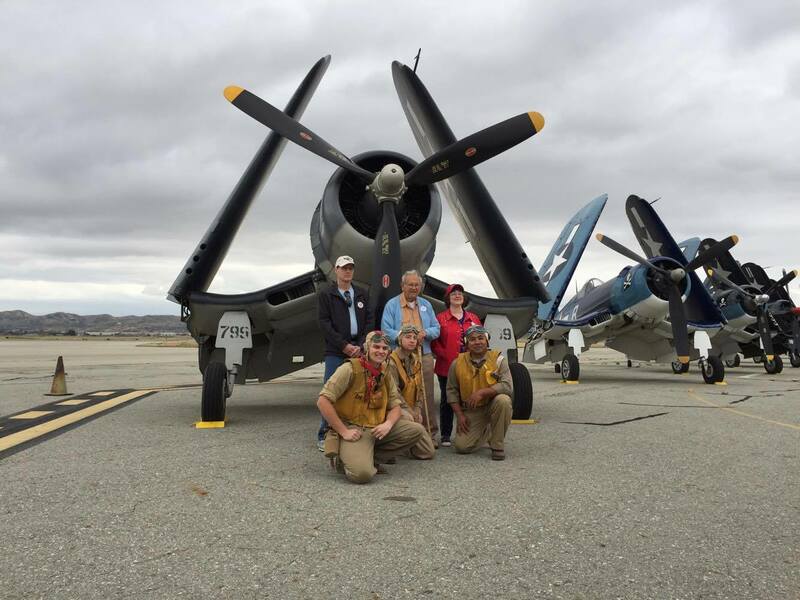 The 2017 air show highlighted the F4U Corsair, with no less than five flying examples attended from across the country. 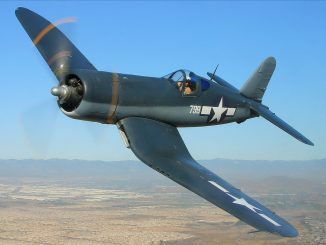 Starting with Planes of Fame’s own F4U-1, other Corsairs included the Erickson Aircraft Collection’s F4U-7, Chuck Wentworth’s FG-1D, Dan Freidkin’s F4U-4 and Rod Lewis’s FG-1D. All five Corsairs made a formation pass at the show, something not seen anywhere in the world for more than a decade. Each Corsair also performed individual passes, much to the crowd’s delight. This air show had several themed segments where related aircraft flew together. 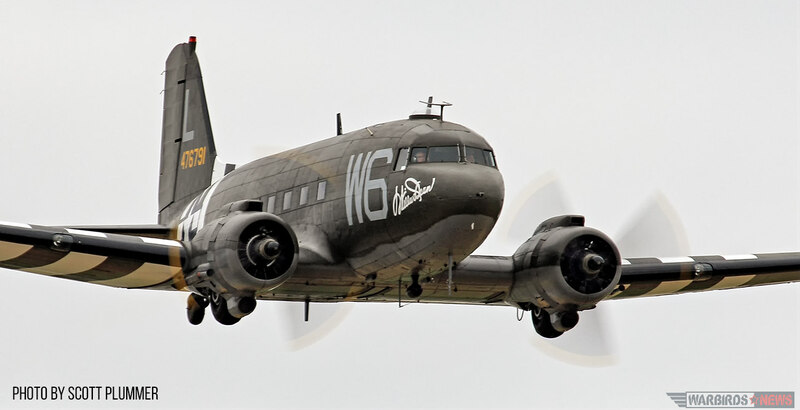 The first of these centered upon the US Army Air Corps and included the P-51 Mustang, P-40 Warhawk, P-38 Lightning, B-25 Mitchell, C-47 Skytrain and Spitfire. The Korean War segment represented a land battle that required air support. This act included the broadcast of the pilots’ radio communications over the air show’s public address system, offering insight into the coordination required to safely control eight aircraft flying at different speeds and directions. The set piece ended with a dogfight between an F-86 Sabre and the MiG-15. 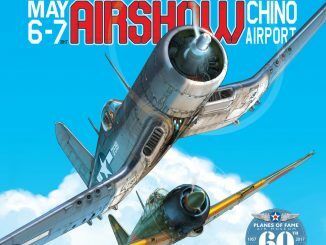 The third and final themed segment focused upon naval aviation where aircraft like the F4U Corsair, FM2 Wildcat, TBM Avenger, F6F Hellcat and F8F Bearcat, a replica Val dive bomber, and a pair of A6M Zeros and SBD Dauntless took part. The Planes of Fame Air Show also includes non-warbird related acts, such as an aerobatic feast from Rob Harrison aka “The Tumble Bear” in his Zlin 142-c. Kent Pietsch flew two performances in his Jelly Belly Interstate Cadet and Philipp Steinbach made the first ever public display in the Gamebird GB1, the newest aerobatic aircraft to win FAA approval in the United States. 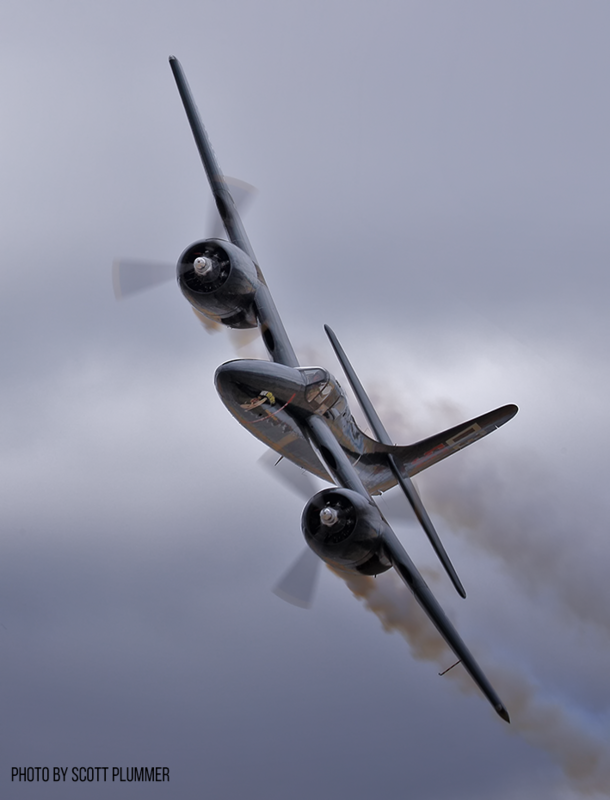 The rare sight of two B-25 Mitchells flying with the uniquely airworthy PB4Y-2 Privateer took place, in some amazing light as the overcast day opened up to let the sun shine on Saturday afternoon during their display. The air show was running about 15 minutes ahead of schedule that day, which allowed these aircraft more flight time as they got lower to the ground on each pass. One of the most beautiful piston powered aircraft of all time, the F7F Tigercat from Lewis Air Legends flew a breathtaking aerobatic routine with Stew Dawson at the controls. The Tigercat, with it’s smoke system pumping out thick plumes of white smoke, made the display all the more spectacular. Soon after the Tigercat completed its display, another powerful radial-engined beauty took to the skies; Dennis Sander’s Hawker Sea Fury. The Sea Fury has Sanders-designed Smokewinders on the wingtips. 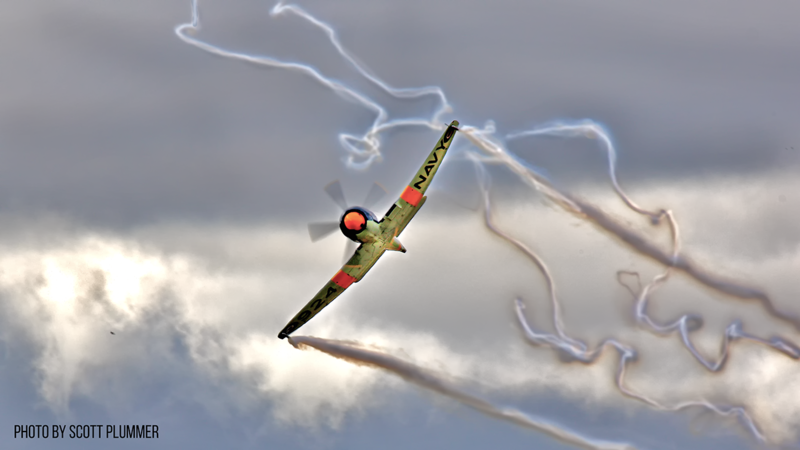 They left prominent trails of white smoke during Sander’s dramatic routine, making the aircraft’s path through the sky highly visible as Dennis Sanders expertly flew loops and low level passes before the crowd. 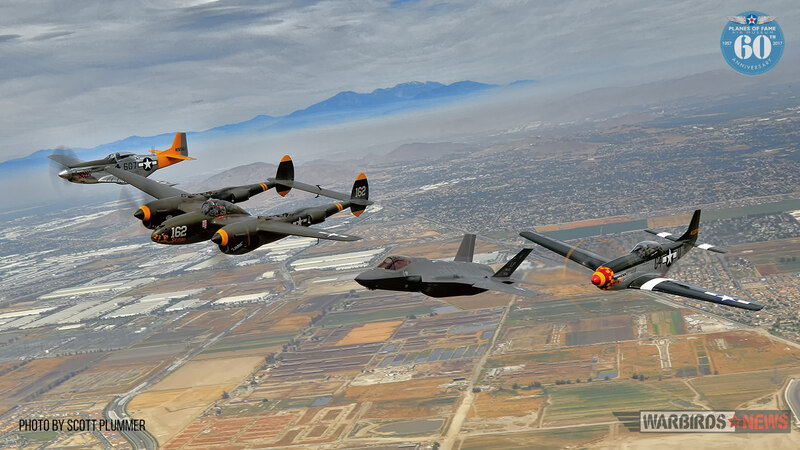 The 2017 Planes of Fame Air Show’s closing act was the Heritage Flight starring a USAF F-35A Lightning II flying in formation with a WWII P-38 Lightning and a brace of P-51 Mustangs. At least that was the plan, but unfortunately the P-38 developed a mechanical issue just prior to Saturday’s performance, so that flight just included the two P-51 Mustangs with the F-35. Sunday, as rain started to fall, the Heritage Flight saw Steve Hinton flying his F-86 Sabre alongside the F-35 and Kevin Eldridge in the museum’s P-38 Lightning. With almost perfect timing, just as the F-35, P-38 and F-86 Sabre landed following Sunday’s Heritage Flight, the forecasted rain that had threatened to fall all day finally came, with lightning shooting from dark clouds in the distance. 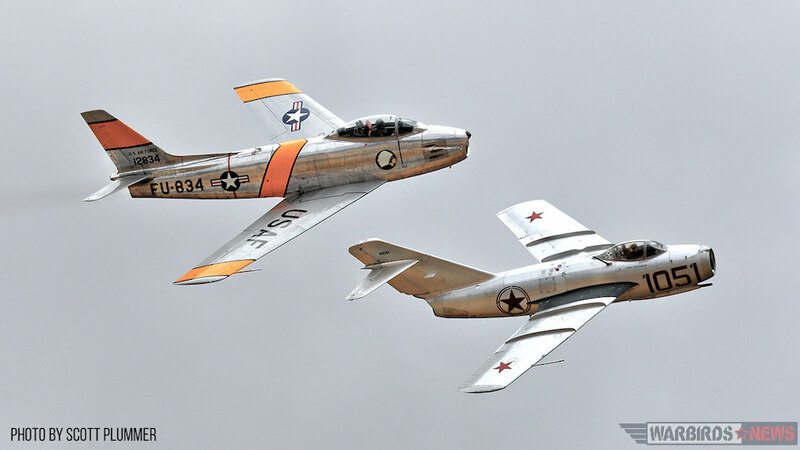 Steve Hinton in the F-86 and Chris Fahey in the Mig-15, Flying Saturday Afternoon Korean War Segment. The storm clouds unfortunately foreshadowed the Air Show’s potentially troubled future. Legal action, that may ultimately prohibit further air shows, is still moving forward. A court hearing will take place this September, and if the plaintiffs win, we may have witnessed the very last Planes of Fame Air Show to ever take place at Chino Airport. Hopefully that will not come to pass! Many thanks to Scott Plummer for bringing us this article, along with his marvelous photography! To see more of Scott’s video and photography work, please click HERE. 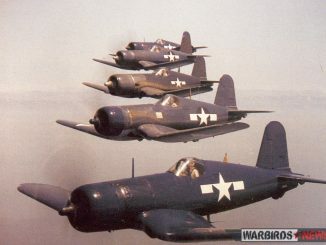 Hey guys, Not to be a pain, but you stand corrected on the statement that 5 Corsairs had not been seen together for more than a decade. 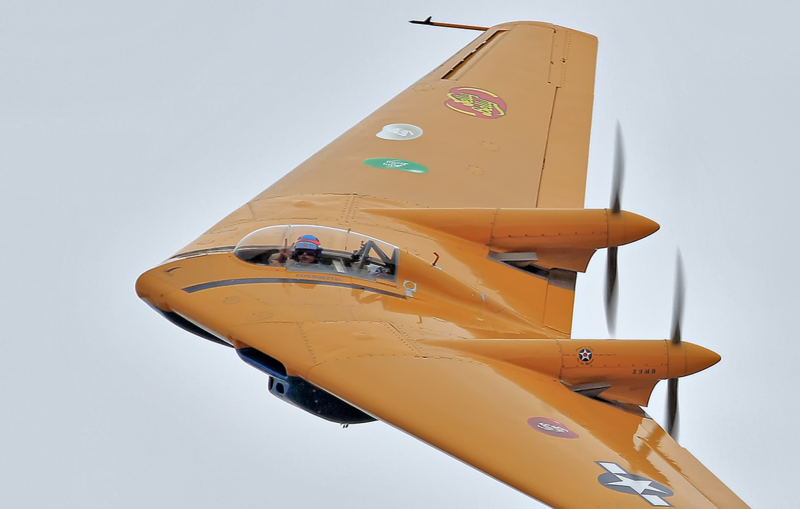 The 2011 Thunder over Michigan show had 6 Corsairs: NX83JC/67089/555 FG-1D, NX773RD/”92433/19″ FG-1D, ‘NX240CF/”82050/K-205″ F4U-4B, NX209TW/”92489/489″ FG-1D, N46RL/92508/31 FG-1D and ‘N9964Z/92468/530 FG-1D. Still, no bad word about the POF show. They’re always amazing! Grtz from Holland! I just wanted to say Thank You to all of you who put in the time and effort to preserve these beautiful birds. I love most of them but have a very special affinity to those Corsairs! So glad that the show happened this year and was so disappointed that I could it be there. I love the P-38 and tha N9M. Hope to be there next year. 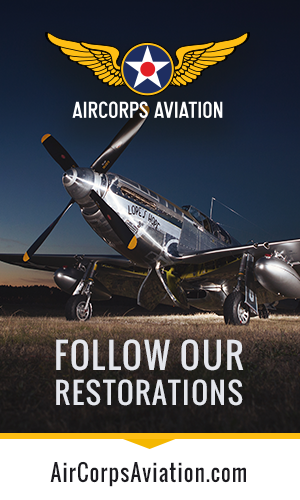 Thank you so much for all the effort and the continuing work and love of these great warbirds. Best airshow ever! Non-stop action, after a couple of hours of fllight line walking to get up close and personal with the aircraft. I have attended this show for the past six years and drive 600 miles roundtrip to be there. I highly recommend this to anyone. And don’t forget to go through the museum.